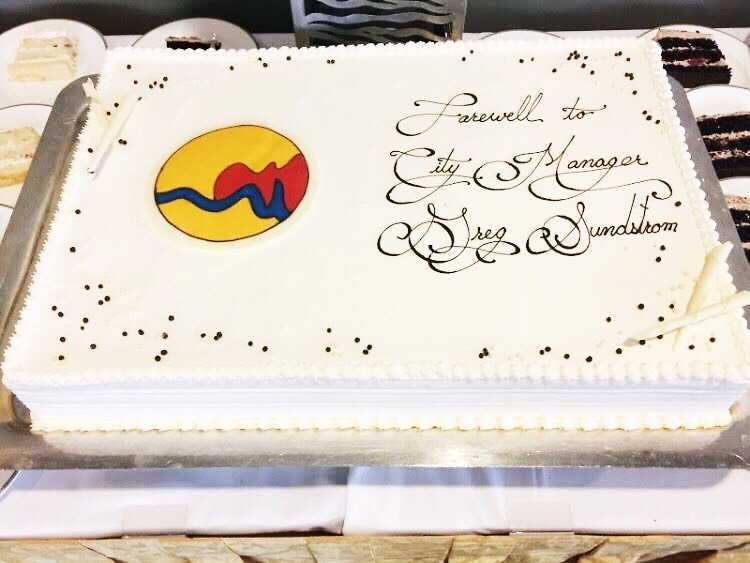 Elected officials, police officers, firefighters and other community members came to say farewell to City Manager, Greg Sundstrom at the DeVos Place, Monday, January 29, 2018. A smooth jazz performance, cheese and wine, a sheet cake with strawberry filling, and other extravagences were rolled out for retiring City Manager Greg Sundstrom on Monday, January 29, 2018 as he attended a party commemorating his successes as city manager for Grand Rapids at the DeVos Place. The musicians of the Isaac Norris Project played all evening long, as guests ate and mingled with Sundstrom during his final days of city manager. Several officials who worked with Sundstrom during his time of service spoke on his character and what he has done for Grand Rapids over the past few years. Mayor of Grand Rapids, Rosalynn Bliss, gave a speech during the party thanking Sundstrom for his service and leading the City through a difficult time. She expressed how she, and many others who work for the city, are glad that Sundstrom is now finding time to relax and take care of himself. A gift was given to Sundstrom at the end of the party by the Mayor and the City Commission of a paid trip for two for a jazz performance of his choosing. He was also given a framed portrait of the Grand River, commissioned by an ArtPrize artist. Sundstrom said the biggest thing he is looking forward to in retirement is being able to do nothing for as long as he can. He said the thing he will miss most about his job is the people he worked with. Sundstrom’s last official day as city manager is February 2, 2018.